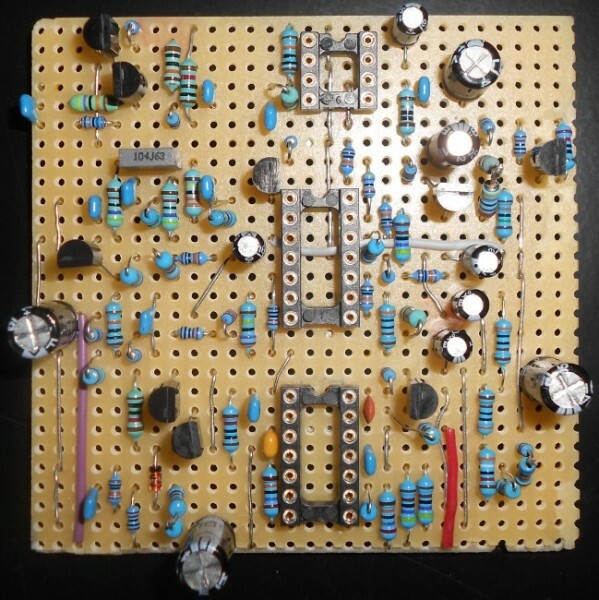 electro-music.com :: View topic - NOISE TOASTER Stripboard? Posted: Mon Mar 18, 2013 12:48 pm Post subject: NOISE TOASTER Stripboard? I've been reading the mfos subforum for a while, but this is my first post, so hi to everyone! I'm also planning to build the noise toaster on a stripboard, but I'm nowhere near yet. Now I'm trying to create the schematics in TINA or EAGLE, export the netlist and import it from VeeCAD for a stripboard layout. If this doesn't work I will try to design the stripboard manually from the schematics, but I'm afraid that won't be easy. Ok, so this is what I came up with. I know that it's insanely crowded and it'll be a pain to build it, but I need to fit it in a box I have. It's area (2,9 x 2,9 inch ~ 7,3 x 7,3 cm) is like the half of Ray's PCB, so I'm a bit worried about crosstalk but I hope it's gonna be all right. I'm also sorry about the crazy jumpering, but I couldn't find a better way to connect C13 and C14 (virtual ground) and also I think sockets (or plain IC-s) have the space under them for wires (for BN bus and X16 connection). Also if you can't connect two jumper wires into the same hole you may have to find a solution yourself, sorry about that. Also note the legs of Q3, Q8 and Q9 - they are bent a bit. I checked it a few times but of course there might be mistakes (it's very likely). I created it using diy layout creator (http://diylc.org/) and I'm attaching the layout file too, so you can redesign, change or correct it if it's necessary. edit, ps: In Ray's PCB the big electrolytic caps have 0,2" lead spacing, but mine are all 0,1", so I designed for them. Also note that legs of C14, C19 and C25 are not in adjacent lugs. I've finished soldering in the jumpers, resistors and IC sockets and I spotted a few errors. 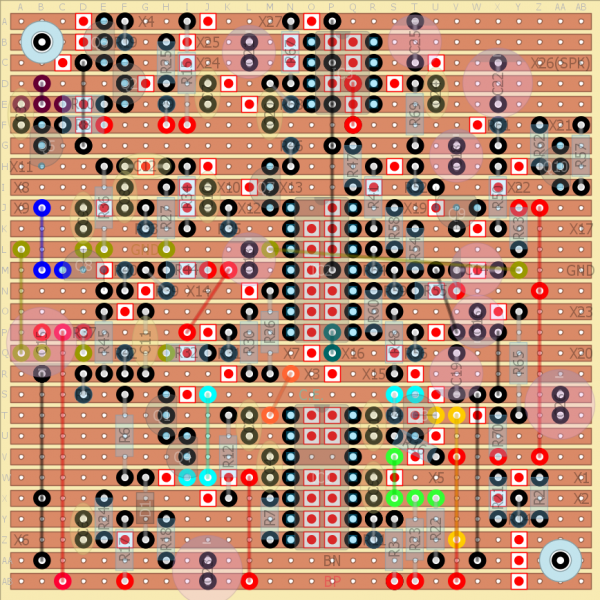 Firstly, I forgot to put R16 on the stripboard layout (its between Q3 collector and BP). Luckily there's space for it (there's a hole between Q3-C and C1, and just under that stripe there's BP), but it has to stand. The other mistake is that C21 is a non-polarized electrolytic cap but I drew it as a ceramic. Anyway the resistors fit in nicely, though a few has to stand. But you can use 1/8W resistors (except maybe for the ones <1k) and then it's less crowded. If you compare it to other mfos boards, it is kinda cheap, but this way it's more cheaper:) plus I live in the UK and didn't want to spend much on the shipping. I plan to enclosure this into a starbucks tea metal box, but I don't have a drill yet. edit, ps: In Ray's PCB the big electrolytic caps have 0,2" lead spacing, but mine are all 0,1", so I designed for them. Also note that legs of C14, C19 and C29 are not in adjacent lugs. Looking at the MFOS schematics and BOM, the capacitors only go up to 26, so I think C29 should say C26. Even if you add Ray's 2 additional external inputs, that only adds one 0.1uF capacitor. 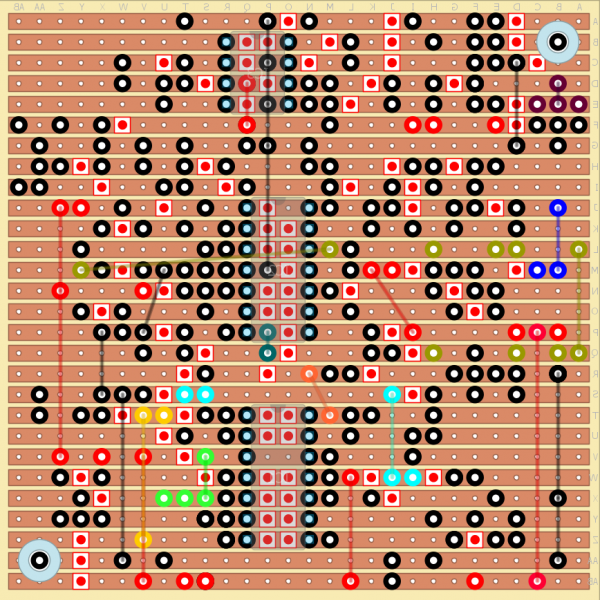 I can't find C17 on the stripboard layout, but that's possibly because it can be wired directly across S7. Just looked at the panel wiring diagram and C17 is indeed wired across S7! Sorry guys, I meant C25 instead of C29. C26's legs are in adjacent lugs. Whew, that's a relief. I was afraid that C29's were suddenly invisible to me. 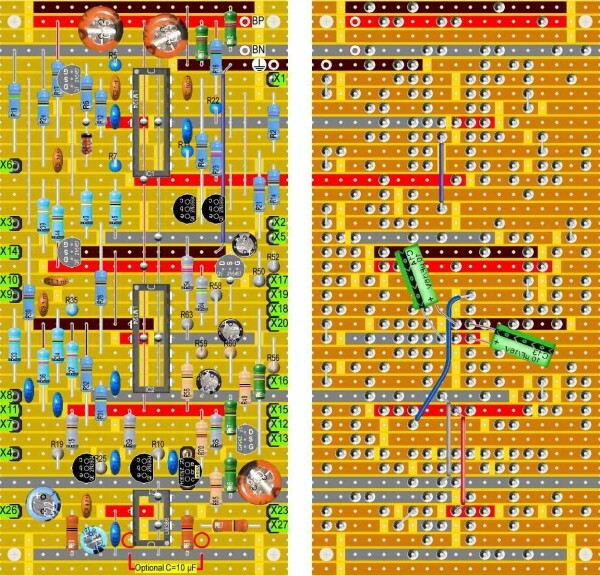 I wonder if there's a way to make the components on the top view of the board partially transparent with that layout editor??? Figuring out which holes the leads of the electrolytics go to with them fully opaque is a bit of a chore. Not complaining, just wondering is all. Thanks for doing this, BTW. Yeah Marv, you are totally right, I should've made a picture that way, too. Anyway, here it is. And no problem at all, I mainly do this for myself, just thought I could share it. Thank you, bence... your effort is much appreciated. I understand completely and am happy for the warning that it's untested. I generally just buy Ray's PCBs because they're reasonably priced and I want to support him to make sure he keeps doing what he does. It'd be terrible to have him pack up and disappear. However, I do enjoy fiddling with stripboards... I find laying them out and checking them against the schematics sort of therapeutic, it's a zen thing I guess. 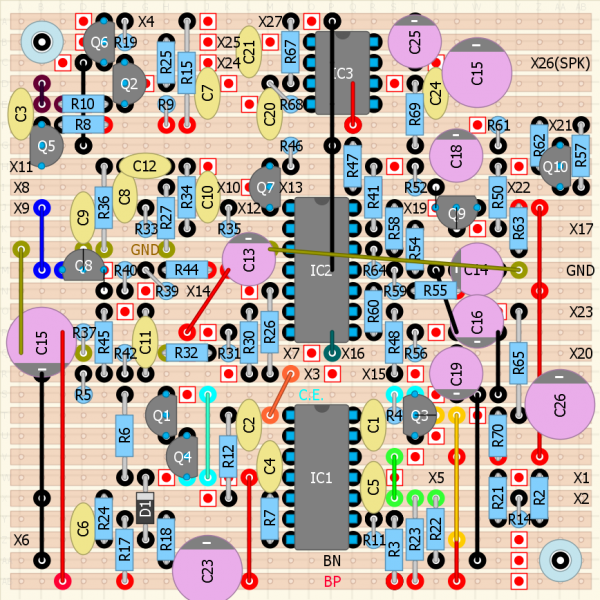 And since my PCB layout skills are not very polished SB lets me get circuits sort of permanently built without the PCB pain. One of these days, though, I'm taking that next step... just need the time to devote to it. Anyway, thanks again... be sure to let us know if it works after you've tested it. Pin 3 of IC1 doesn't seem to connect to the virtual ground. Pin 11 of IC 1 doesn't seem to be connected to BN. These observations may be a result of my own ignorance, so if I'm confused, please let me know. IC1 pin3 is connected to pin12, and therefore virtual ground, because the strip there under the IC is not broken (check it on the last pic). I reorganized that part of the layout a few times and I must have forgot to place that link again..
- Still working. Mising: Q10,R57,R61,R62,X21,X22. If I fail, I will use a H25SR075 stripboard. I added a dc input and an attenuated earphone out (drived by the 386). I also added an external CV input and a pot for the VCO, an input for the VCF and a gate input (I plan to build a simple 8step seq). I don't know if I will make a proper layout later, maybe if I have time..
Hi all, sorry for getting this back from the dead! I ordered the components from Farnell (waiting delivery today) and Ill give it a try in a stripboard! At the moment my workbench is not fully equipped (scope, bench power or super cool multi, just a basic one) but I think it wouldn't be a problem. 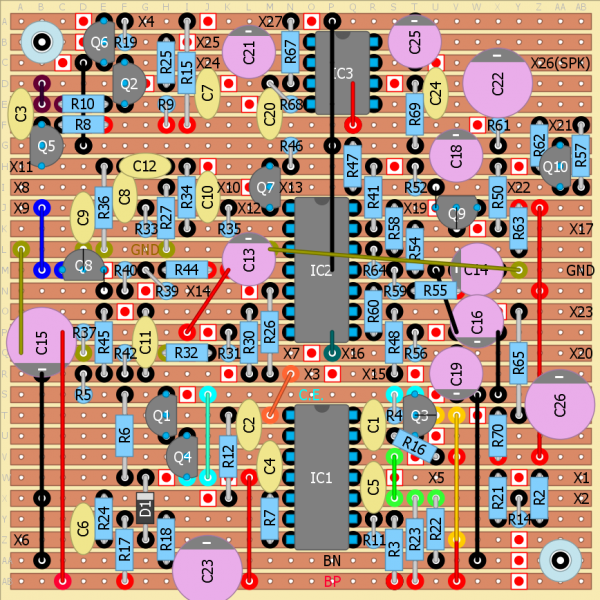 As a goal, Im aiming to start building a modular synth (Ill get the MFOS PCBs) after easter. So Im after a Rigol scope and a nice Fluke multi at some point. Thanks for the stripboards guy! Much appreciated! btw! Anyone tested the stripboard versions in this page?!?! I have ordered the PCB but Ill try to play with the stripborad untill I get it in the mail. Well I finished a toaster based on that layout, but since the layout has a few errors I had to fix them when troubleshooting the finished unit. Anyway I wrote all the fixes here, so you should be able to build this based on the info in this topic. 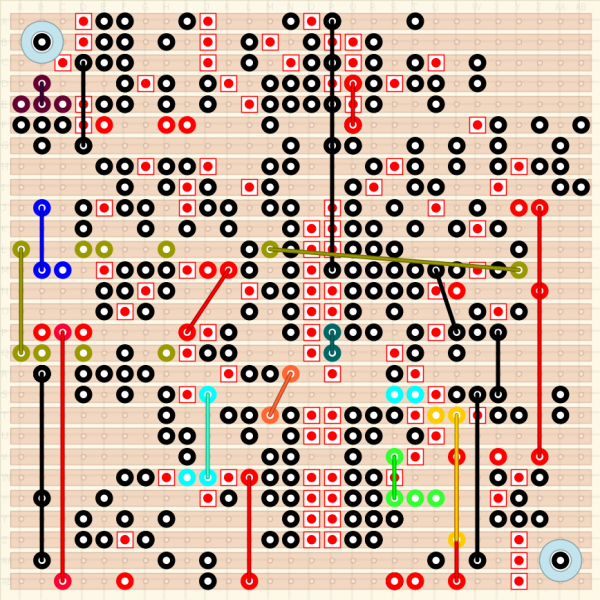 Instead I made a 8-step sequencer for the toaster. After this time I am not sure if you can recall but your design looks good and I'm wondering whether you implemented with those missing items, or alternatively what your solution was?